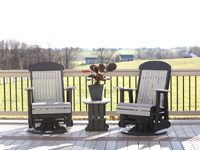 Lawn Furniture | Your Local One-Stop Shop Since 1998! 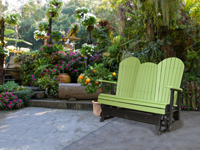 If you’re looking for outdoor furniture to complete your patio or gazebo, yet you don’t want to spend a lot of time caring for it, you’ve found the right place! 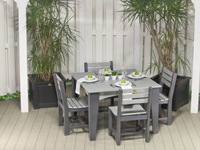 LuxCraft Poly Furniture is a maintenance-free furniture that can be left outside all year around. Quality - Quality is our number one goal! What makes LuxCraft so much better? 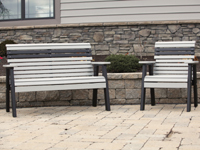 We reinforce our swings, gliders, and benches with aluminum angle braces. All furniture is assembled with stainless steel screws. Poly glider arms are used for a stronger, smoother glide. 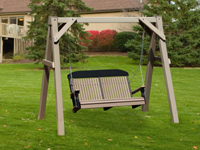 Swings come with a heavy-duty chain rated at 800# per side. Be sure to look for the LuxCraft plate on our furniture! 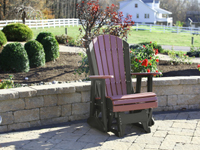 Polyethylene - These quality pieces of handcrafted furniture are made of polyethylene. The high density polyethylene raw material utilized in poly lumber is derived from post-consumer bottle waste such as milk containers. 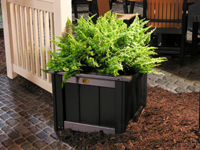 This material is cleaned in a decontamination process to a purity level of over 99% HDPE. It is then compounded into rigid board stock material; the resulting finished product containing over 90% recycled post consumer waste by weight. » No maintenance such as painting, scraping or replacing. 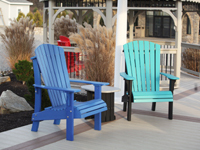 » Chairs, gliders, and swings are reinforced with aluminum angle braces.